This week is the twenty-first anniversary of my mother's death, Mama. 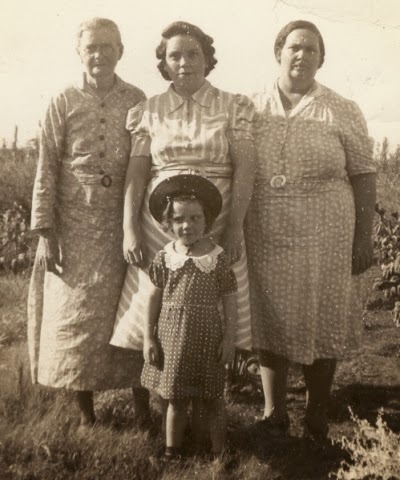 This summer we passed the twenty-first anniversary of her mother's death, Big Mama.2 These are the closest of my mitochondrial DNA ancestors and they made me the person I am today. They died four months apart. I still miss them terribly and feel compelled to write about them today. Big Mama's mother, called Granny, died when I was about ten and hers is the first funeral I remember attending. Granny's mother, called Ma Johnson, died before I was born. These four women are pictured below. circa 1940, from the collection of the author, used with permission. It was a difficult year, 1992. While the country was electing a new president I was helping write wills and obituaries then going through the remains of two lives determining what to save. While everyone around us was getting ready for Trick-or-Treat we were holding the third family funeral within four months (one of Big Mama's brothers died six days before my Mom). A Halloween flower arrangement was picked out by my sister who is mentally about age six due to epileptic seizures she had as a baby. Even though some family members thought it was tacky, Mama would have laughed about the orange and black flowers at her funeral service. She had a wicked sense of humor and was anything but conventional. Big Mama was more conventional except when the safety and happiness of family members were hurt by those conventions. She surprised me more than once when she suggested possible responses to big events in our lives. What would they have been like if they had not had to work so hard to provide for their families with no help from the fathers of their children? Both of these strong women raised their children alone in a time before the government tracked down deadbeat fathers. Both worked long hours at jobs that required weekend and night work. One a waitress and later a private duty nurse. One a carhop and later managing what we called a hamburger stand. This was when they were still family-run small businesses and not huge corporations with a place on every corner. Twelve hour a day jobs, often seven days a week. Not much leisure time for either, but Mama and Big Mama made time for the important things in life. Santa Claus visited our house in the afternoon before the late work shift started so Mama and Big Mama could see our faces light up. Both seemed to always love their first husbands even after what must have been heart-breaking divorces. During the 1960s to 1980s my mother saw my father whenever he came back to town, sometimes many years after his last visit. For some reason he gave up a job as an airplane mechanic and became a truck driver, traveling all over the continental U.S. My Mom often joked he probably had a woman in every city. When Mama died my father bought the cemetery plot next to her. Even though they couldn't live happily forever after in life, they seemed to care for each other and he wanted to be near her in death. My grandmother married my grandfather in 1934 and again in 1958. He was not around for twelve years and I don't remember ever meeting him when I was a child. They spent the rest of their lives together after 1970 in an obviously affectionate relationship. I saw this when I lived with them for a few months after my divorce. After my grandmother's death her sister said, "She had a hard life." The sister was referring to the things Big Mama put up with in those early years with my grandfather which I won't describe here. Thank you to all of my mitochondrial mothers for making me who I am. I can't identify all of these women yet, but I have a feeling that more of them were strong women who worked hard to hold their families together. I hope to identify more of these mitochondrial ancestors soon. I feel our female ancestors deserve just as much of our research efforts as the men even if it usually takes more effort to learn more about the women in the past. 1. Google Books (http://books.google.com : accessed 21 October 2013), search for "time heals all" and "how much time." These two phrases together seem so familiar that I searched Google Books to see if I was repeating something I've read elsewhere so I could cite it. Similar phrases pop up in about 100 books, but none of them are books I have read. Maybe this is a universal human sentiment when we feel grief that lasts a long time. 2. No citations are provided to their death certificates or other records due to the wishes of living family members. These documents and references are in my personal files. Other remembrances in this essay are from my own memories. 3. "Introduction to Your Story," MTDNA section, Geno 2.0 Project, National Geographic (https://genographic.nationalgeographic.com/results/welcome : accessed 4 May 2013); name and kit number withheld for privacy reasons. Debbie Parker Wayne, "My Mitochondrial Mothers," Deb's Delvings Blog, posted 21 October 2013 (http://debsdelvings.blogspot.com/ : accessed [date]). I really enjoyed reading this. What a great story Mom!